Mikey may not be a late-night shock jock, but he never disappoints with his Movies You Have Not Seen But Should; check out Talk To Me this week! Time once again for another installment of Movies You Have Not Seen But Should. This week, we will look at 2007 historical drama Talk to Me. The film’s stars include Don Cheadle, Chiwetel Ejiofor, Taraji P. Henson and Cedric the Entertainer. The film is based on the true story of the life of Ralph “Petey” Greene. Petey Greene (played in the film by Cheadle) was a famous radio DJ talk show host in Washington D.C. throughout the 1960s and 1970s. The film focuses on the relationship between Greene and his friend and manager Dewey Hughes (played in the film by Ejiofor). Greene was an ex-con who caught the attention of Hughes because of Dewey’s brother Milo (played by Mike Epps). Hughes was working at the radio station WOL in Washington D.C. and hired Greene to be a disk jockey at the station. At first, Greene has a rough transition into working in a radio station. But the more his personality comes out through the radio, the more comfortable he becomes. He earns the trust of his co-workers including fellow DJ “Nighthawk” Bob Terry (played by Cedric the Entertainer) and head of the station E.G. Sonderling (played by Martin Sheen). He also becomes one of the most popular DJs in the city. People tune in and call when Petey is on the radio. He becomes so successful that he also hosts a local TV talk show. As Petey gets more successful and famous, it changes the dynamic of the friendship between him and Dewey. As well as dealing with his new found success and the trappings that come along with it, Petey is trying to also juggle a relationship with Vernell Watson (played by Hinson). There are highs and lows as both Petey and Dewey try to figure out who they really are and what their dreams are. Want to know what all happens? Check out the film. The film covers the timeline of Greene’s life between May 1966 and January 1984, which was the memorial service for Greene. Like many films based on a true story, there are elements that have been embellished or scenes added that didn’t take place (one of the main ones being that Petey Greene never appeared on the Tonight Show with Johnny Carson as was portrayed in the film). However, the film portrays the time period of the 1960s & 70s well and does tell a compelling story of Greene and Hughes. Along with staring in the film, Cheadle also was a producer on the film. It debuted at the Los Angeles Film Festival on June 22, 2007. It then opened in limited release in the U.S. on July 13, 2007 before going nationwide on August 3, 2007. It was well received by critics as it has a 87% freshness score on Rotten Tomatoes. Talk to Me is available on DVD, Blu-Ray and Amazon Instant Streaming. 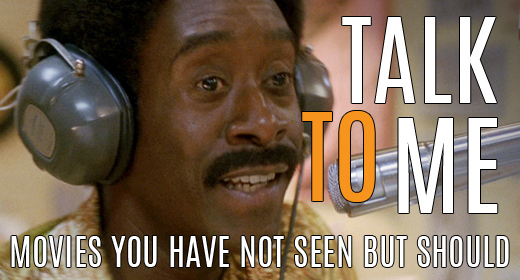 If you’re a fan of Don Cheadle, you’ll enjoy this film. This is a film that pulls no punches but it is a film that will get you thinking. It is a film that you may not have seen, but you should. @joshsteen, your content is featured on @theneeds #Movies! Visit http://t.co/oszhQZASF8 & RT to get more votes & views!